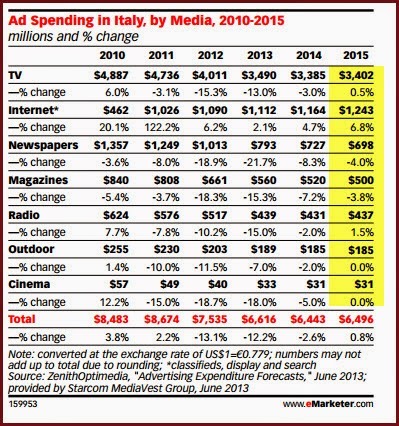 The bulk of media advertising spends in Italy continues to be the TV, Internet and Newspapers with TV topping the list . TV advertising in Italy makes the largest pie of media ad spends with $3.4 billion being spent on the medium in 2015. However the last few years has seen TV ad spends in Italy decline by an average of 12%, except 2014 when it declined by 3%. In 2015 Italy is likely to see 6.8% growth in media spends across the digital channel , as it set to surpass $1.2 billion.